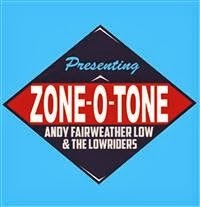 Why is Andy Fairwheather Low? He's merely three feet tall? Nah. Pun intended and the lame example of a beginning, etc. The man came to fame in the swinging sixties as the lead vocalist with Amen Corner and scored several hits, including the number 1 "(If Paradise Is) Half As Nice". He went on to enjoy a successful solo career, and enjoyed another hit with "Wide Eyes And Legless". Also known as second guitarist to the U.K. stars as he played a role working with the likes of Eric Clapton, The Who, George Harrison, Roger Waters, Bill Wyman. The latter not the musician to be connected to since he dated the 12/13 year old and married her a couple of years later (Mandy Smith). The band, 'The Lowriders' consist of Paul Beavis on drums (Thea Gilmore, Robbie Macintosh & Sunday All Over The World), Nick Pentelow on saxes and clarinet (Roy Wood, Roger Chapman and Gary Moore) and long standing associate Dave Bronze on bass (Clapton, Concert For George, Dear Mr Fantasy tribute to Jim Capaldi). It's very much the throw-back album inspired by the music of Stax and Atlantic soul/R&B, The Four Aces, Josef Locke, Johnny Kidd, Lonnie Donegan, The Shadows and many more. A couple of the tracks are perhaps a tad too similar in structure and style to the classic 'See You Later Alligator'. The really laidback material on the other hand may certainly remind you of Slowhand and Macca a.k.a. Eric Clapton and Paul McCartney. AFL is still a very impressive vocalist and the horns backing provide a certain 'Yorkshire sound' to the melodies. The end result is an album of vitality and professional songs that combines the old sound with todays technology and recording. Solid as a rock.